After her father is killed during his arrest for a Catholic conspiracy against the queen, young Katherine Arundell joins his fellow conspirators in the plot. When it’s learned Queen Elizabeth has asked William Shakespeare to perform a play on Twelfth Night, the group decides that is when they’ll strike. Dressed as the boy Kit Alban, Katherine is to join the cast. During the performance, she will kill the queen. During auditions for the play, Katherine meets Toby Ellis and their lives take a turn neither expects. Toby is one of spymaster Robert Cecil’s men, those who target anyone thought a danger to the crown. His unrequited love for author Christopher Marlowe brought him to Cecil’s attention, and when Marlowe is murdered (some say by Cecil’s orders), he recruits 19-year-old Toby to take his place. At Cecil’s suggestion, Shakespeare’s play is replaced with one Toby wrote. Undercover as one of the actors, Toby investigates the men in the cast he finds suspicious. During rehearsals, however, he meets the boy called Kit, and is immediately attracted. As the night for the play draws nearer, Katherine and Toby’s relationship goes from fellow actors to friends, and then that final step into something more. That’s when everything falls apart. At the moment of truth, Toby discovers the boy he’s come to love is actually a girl in disguise, a girl who may be a traitor. Now it’s a question of whether he’ll let his feelings for a boy who doesn’t really exist overcome the oath he took to protect the queen, or if he’ll turn traitor and let the plot continue. But does he hate enough to cause her death? In Toby and Kit, Virginia Boecker has created one of the most winning couples this reviewer has recently encountered. 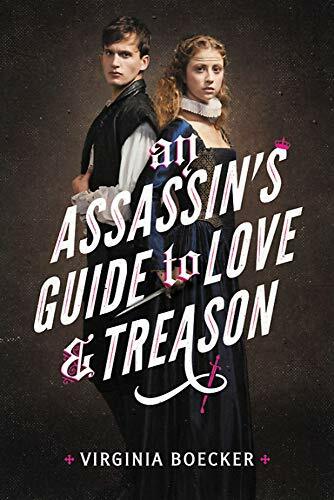 With a plot resembling one of Shakespeare’s plays, in which “illusion, deception, madness, and the extraordinary things love will cause us to do” are revealed, this novel is a delightful amalgam of romance and adventure. Mixing historical figures with fictitious ones is nothing new, but all come to life through Boecker’s pen. Cecil is cold-blooded and dedicated, showing no remorse for the deaths he causes, even those of his own men, as in Marlowe’s murder. Shakespeare is at the same time a talented but conceited writer, changing lines even as the players speak them, and a harried stage manager, hustling characters on and off stage. Assigning authorship of Twelfth Night to Toby is a clever way of pointing up the long-standing question of authorship of some of the Bard’s plays. The tale is told from both Katherine’s and Toby’s point of view and the reader is cautioned to be observant and watch the chapter headings carefully to determine which character is speaking. This type of narrative gives the story a more emotional impact than an omniscient telling would. There will be delight in Katherine’s freedom pretending to be a boy, her hope that Toby can love the person she is and not merely her gender, and her despair when love gets in the way of a mission she was prepared to give her life to complete. Toby is just as three-dimensional a character. Wishing to free himself of Cecil’s grasp, he plans to disappear as soon as the current plot is uncovered. His anguish as he discovers Katherine’s deception and his struggle to do what he should as opposed to what he wants, will wring the reader’s heart. If there’s one flaw in this otherwise beautifully written story, it’s the irritating use of first person present in the narration. This reviewer would have liked to read this novel in one sitting. Unfortunately, its length precludes doing so. Any reader hardy enough to try—and most will want to, spurred on after finishing the Prologue—be warned: Prepare for a sleepless night. Anyone picking up this novel won’t wish to put it down until he’s read every word . . . all 384 pages of them.